Why does alternative medicine work? Research (on over 600 modalities, or types, of alternative medicine therapies) by the National Institutes of Health seeks to answer these questions. Researchers are running controlled tests of alternative therapies on an ongoing basis. University of Maryland Medical Center implements 3 complementary therapies for their trauma victims. Read more here. 1993: National Institutes of Health establishes the Office of Alternative Medicine (OAM) expressly to examine the merits of such techniques. by 2002: OAM morphed into the National Center for Complementary and Alternative Medicine (NCCAM). Studies are being done as you read this, and studies have already been completed by the NCCAM. To read those studies and their research protocols, access the table of contents lower down this page. And remember, be a savvy reader--to learn how, follow the Savvy Reader link. The Good News: studies are running even while you're reading this. The Bad News: scientific language--argh!--long, heavy text--makes these studies difficult to understand. And if you have something, you'd like to see that's not here--write to the Health Hound using the Contact Form! 50% of Americans will over their lifetime. To see the page on prayer as complementary medicine, click here. 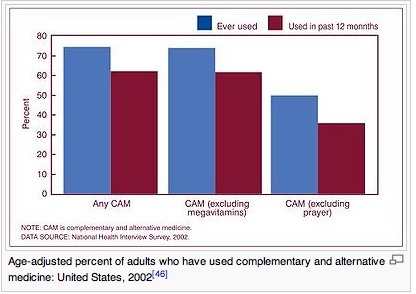 25% Those who used complementary and alternative medicine because they were referred by a medical professional! What's Dr. Weil got to do with this? Andrew Weil, M.D. has had a passion for complementary and alternative therapies for decades. 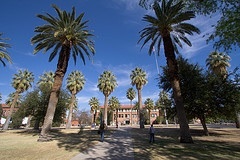 He now heads up the program of Integrative Medicine at the University of Arizona, College of Medicine. He influences the scientific community, opening pathways from traditional medicine to include these additional methods. To jump to Dr. Weil's page here, click on photo link. For instance, nursing schools teach complementary and alternative medicine on over 85% of their 585 campuses. 60% of medical schools offer CAM as part of their curriculum, too. Then, look at the 19 medical schools that offer a Doctor of Osteopathy degree; of these, fully 95% offer training in CAM. Return from Research to Healthy Alternative Solutions.